What Kind of Plants Are in the Emergent Layer of a Rain Forest? Rain forests consist of four "layers," based on the size of the trees and foliage. The names that have been given to these layers are 1) the emergent layer, 2) the canopy, 3) the understory (also called the "middle story" or "lower canopy") and 4) the forest floor. The emergent layer is the top-most layer and is made up of the tallest trees. The emergent layer consists of the tallest trees of the rain forest. Emergent layer trees are often referred to as "giants" and can reach heights of 180 to 200 feet. 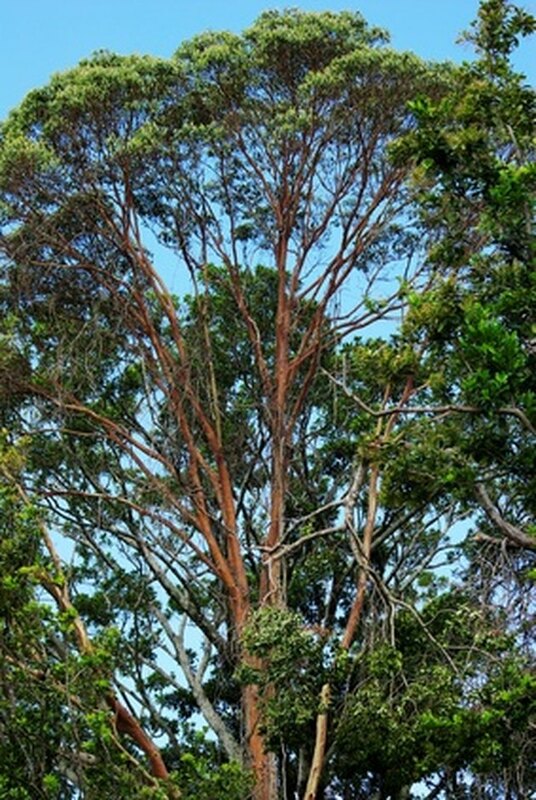 To maintain such heights, these trees must possess strong, highly water-resistant bases and trunks and wide-spreading tops with tough, waxy leaves. Because the trees of the emergent layer are unprotected, they are subject to the most extreme weather of the tropical region. Emergent layer trees must cope with intense direct sunlight, powerful winds, prolonged dry spells and periods of heavy rain. Over time, these trees have learned to adapt to such changes. The kapok tree produces bright rain forest flowers. 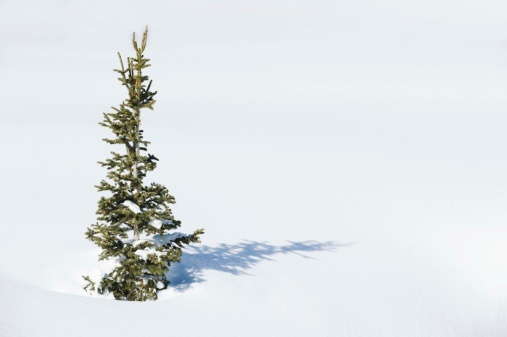 As the website TigerHomes.org points out, the most common kinds of trees occupying the emergent layer are hardwood evergreens and broad-leaf. Two primary examples of such emergent layer trees are the kapok and the Brazil nut. Both contain very expansive tops, produce flowers and provide homes to many species of birds, animals and insects. 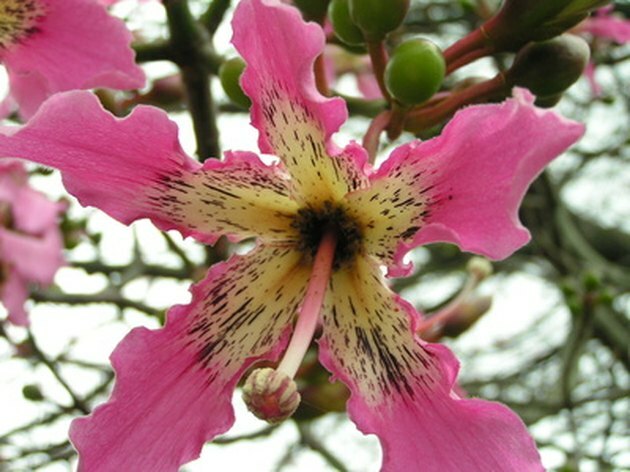 In addition to the flowers produced by such trees as the kapok and Brazil nut, orchid varieties may be found in the lower sections of the emergent layer. 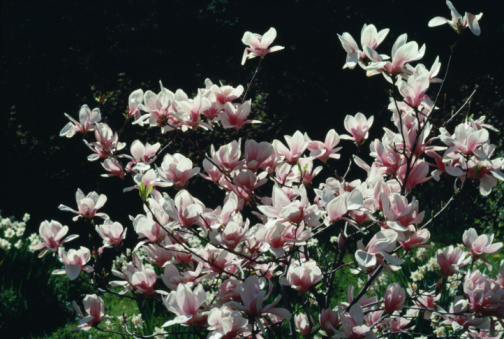 But most flowers and plants exist in the three other layers, which are protected by the emergent layer. The trees of the emergent layer take advantage of their height and also of the strong winds and scatter their seeds and pollen throughout the lower layers. According to the Smithsonian Tropical Research Institute, some trees produce seeds with "wings" that allow them to fall far away from the parent tree, thereby avoiding competition for food and water. Because it is subject to the direct rays of the sun, the emergent layer is also referred to as the "sunlit zone."